I have had Bonnie for almost 1 year and she still hates me! What do I do? It takes a very long time and a lot of time, patience and work to tame an aviary bird that was not hand-fed... I don't know exactly what you have been doing to try to 'win her over' but, personally, I don't try to tame them. I have four budgies right now and are looking for another pair to 'complete' my little flock because this is the way they are happiest and healthiest [budgies are very flock-oriented and are only happy when in a flock] as taming them brings no benefit to them. But the way to do it is to spend A LOT of time in the same room with them, talking, singing, whistling to them and offering them every now and then a treat which should NOT be a reward or a bribe but a gift, a token of friendship from you to her. But, in order for the 'gift' to work, you can't free-feed pellets or seeds, you need to feed something like gloop, mash or chop for breakfast [never forgetting the leafy greens they love] and a good quality seed mix for dinner so you can use something like safflower seeds as treats [you can also use a tiny piece of a millet spray]. 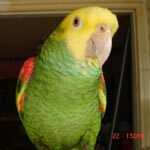 The trick is to keep the cage high so the roosting perch is at your eye level when you are standing up and never to get too close to the cage until the bird is accepting of your presence so as not to intimidate it. Never put your hand in its cage unless you are putting fresh water or food in it which should always be done AFTER letting the bird know what you are going to be doing [I say "Excuse me - excuse me - excuse me"], never using any flooding techniques like taking the bird to a small dark room or grabbing it and forcing it to accept your touch, etc. Clipping them is also not good because it makes the bird feel very vulnerable and stressed out so it's harder for it to relax and learn to trust you. Myrtle is 8 and I have had her 7 years. She loves me and depends on me but will only allow me to scratch her head when she is hormonal.